Heathrow has implemented its 50th electric vehicle in line with its plans for all its cars and small vans to be electric or plug-in hybrid by 2020. Supplied on lease, the latest Renault ZOE joins other ULEVs on its fleet, including Nissan Leaf cars and ENV200 vans, a BMW i3, Renault Kangoo Z.E. vans and Mitsubishi Outlander PHEVs, which are reducing the airport’s fleet emissions by 165 tonnes of CO2 per year, equivalent to the amount of energy used by 18 homes annually. 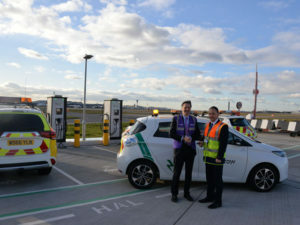 Heathrow – which scooped the award for Ultra-Low Emission Infrastructure at the Energy Saving Trust’s 2017 Fleet Hero Awards – currently has more than 80 EV charging points available to passengers, colleagues and airside vehicles, said to be the highest density of EV charging infrastructure in Europe. Heathrow is also actively working in collaboration with TfL to install seven rapid charging points for black cabs before the end of 2017. These rapid charging points, some of the first in London, will support the Mayor’s requirements for all newly licensed black cabs to be either electric or plug in hybrid by 1 Jan 2018. Heathrow has also committed to switch all large vans and half of its HGVs to electric or PHEVs by 2030 through the EV100 pledge.